Possibly a company could build any decent knife around that selling point and find a market -- without the MAGIC system, this unusually styled knife might be more of a curiosity. But release the slide lock and push the knife blade forward with the thumb stud at the base of the blade, and the MAGIC spring-loaded opener swings the blade forward to lock securely in place. To close, release the knife's liner lock and press the blade back into the handle, locking the action with the slide. If it does that well, it doesn't need to be pretty. With the rest of the knife, the company went a bit wild. 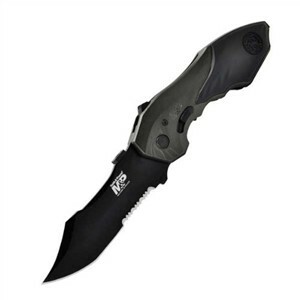 The extremely sculpted blade features an upswept point, false upper edge, and a wicked combo-serrated cutting edge. The knife's handle still has the pistol grip look of its predecessor, but the machined aluminum frame with rubberized inserts shows fewer of the blocky edges that made the old model less than comfortable in use. Rounded contours in the handle of the SWMP5LS allow a solid grip and powerful control without all the unfriendly corners. The 3-1/2-inch tactical black blade of 4034 high carbon stainless steel does have enough plain edge up front for normal uses and rips easily through cord or seat belt harnesses with the serrated portion. The folding clip M&P could be a good emergency knife for drivers -- a glass breaker hilt for pressure-smashing car windows is part of the deal.